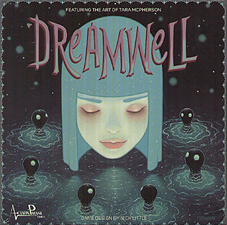 Dreamwell is a 2-4 player competitive game featuring the art of Tara McPherson. Players must locate their lost friends in the Dreamwell, which is represented by a 4x4 grid of tiles. Each tile shows a terrain and a creature, in addition to pathways to neighbouring tiles. Only by carefully navigating the maze-like Dreamwell can you locate your friends and win the game.